"What we esteem is to create spaces not only to ""stay"" but to ""relax"". The most spacious 50-square-meter room of the first-class deluxe twin, three types of western rooms and Japanese room full of warmth are available. 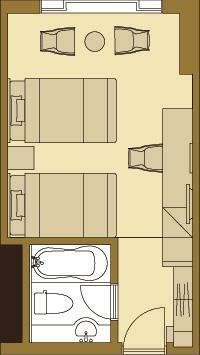 Select a comfortable room type suiting the number of guests and the trip purpose. Everything including open atmosphere and extensive amenities are all for our guests." Hotel Crown Palais Kokura is a city resort hotel, located by the Murasaki river and 11 minutes walking from JR Kokura Station where is called “the gateway to Kyushu”. banquet hall equipped with extensive facilities, and sophisticated gourmet dining. © 2019 Hotel Crown Palais Kokura All rights reserved.